Upgrades & Accessories for your Dynamometer. Click on an Accessory link below, or scroll down the page. If you currently have a S68, S125 or a T62 inertia only Dyna Pro Dynamometer, then you can upgrade your existing Dynamometer to a full Load Controlled Dynamometer (-LC), with the installation of the Eddy-Brake upgrade kit. With the addition of the Eddy-Brake Upgrade it enables the user to carry out a more complete range of tests. Full 'Closed Loop' control of the Eddy-Brake enables a vast range of tests to be made with the minimum of effort. Wind Drag, Sweep / Step Testing & constant loading are just some of the features of upgrading to a full Load Controlled Dynamometer. With the LC Dynamometer, inertial acceleration testing can still be performed as with the standard S68, S125 & T62 Inertia only Dyno’s. 2 year replacement parts warranty. Engine / Vehicle cooling is absolutely essential from both the tuning point of view, and to the well being of the vehicle being tested. High engine temperature can lead the ECU into 'Safe-Mode' which is undesirable if you are carrying out fuel or ignition re-mapping. Dyna Pro Dynamometers has developed these high volume (80 mph, 3500 m³/Hr Each), high static pressure cooling fans for efficient cooling of the vehicle being tested. The design incorporates a polarizing air diffuser to produce a highly directional laminar air flow directly into the radiator of the vehicle. The mounting hardware has 4 point movable and locking joints, so positioning the fans in any direction is no problem. The fans are controlled from the 'Hand Controller Pendant', and can be set to ON/OFF and Automatic. The cooling fan system comes as part of the 'Show Package Deals'. The Dyna Pro Dynamometers Wideband Air/Fuel Gas analyser is an essential tool for anyone who is trying to maximize the power from the vehicle on test. The only true way to re-map or jet a vehicle. All Air/Fuel data can be display real-time or plotted against Power, Torque, RPM etc. The Air/Fuel Gas analyser comes with a high quality reliable vacuum pump, filters and 'Sniffers'. 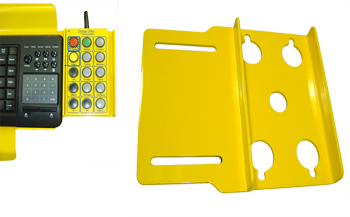 The Air/Fuel Gas analyser can be mounted in the side panel of the Dynamometer or can be left free standing. 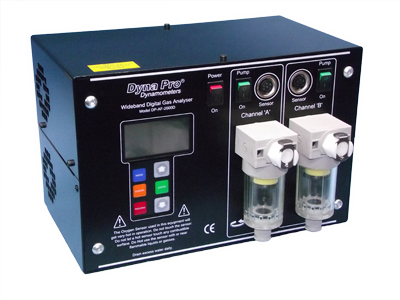 Air/Fuel Gas analysers are available as single, dual or quad channel. Dual Channel Wideband Air/Fuel Gas analyser. All Air/Fuel data can be display real-time or plotted against Power, Torque, RPM etc. The Air/Fuel Gas analyser comes with a high quality reliable vacuum pumps, filters and 'Sniffers'. The Duel Air/Fuel Gas analyser can be mounted in the side panel of the Dynamometer or can be left free standing. Dyna Pro Auto Climate Monitor module saves the routine of manually inputting climate conditions. This unit will automatically display on screen Temperature, Pressure, Humidity and Relative Air Density (RAD). The Auto Climate Monitor comes as part of the 'Show Package Deals'. 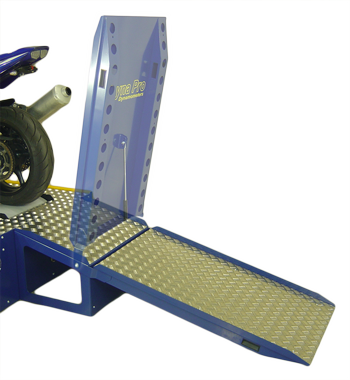 The Dyna Pro Gas Assisted Loading Ramp allows for easy and safe loading and unloading of motorcycles from the Dynamometer. The design features a wide (80cm Width) ramp, with a hydraulic gas strut and inbuilt handles for easy one handed operation, with the ramp in its upward position, it also act's as a chain and stone guard to the rear of the Dynamometer. The Gas Assisted Load Ramp comes as part of the 'Show Package Deals'. To aid the dynamometer operator, a heavy duty, Keyboard and Monitor Arm system which is movable and lockable in any position. The design incorporates a 'Hand Controller Pendant' home, which allows the operator to use the pendant freely or leave it in its home position. Cables can be routed through the Keyboard/Monitor Arm for a tidy installation, and there is even a place to hang the ignition pick-up clip from. The Keyboard/Monitor Arm can be mounted on either side of the dynamometer. The Keyboard/Monitor Arm comes as part of the 'Show Package Deals'. 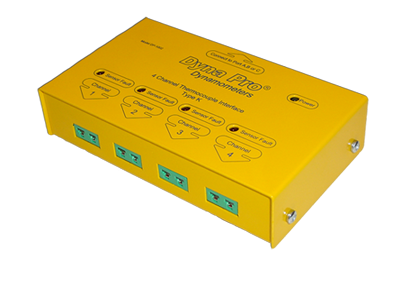 The Dyna Pro 4 channel Thermocouple interface Unit allows the user to connect up to 4 type 'K' thermocouples to the Dynamometer for temperature measurements. The interface will measure temperatures between 0°C to 1250°C using industry standard thermocouples. All data can be overlaid on dyno graph. A maximum of 3 Thermocouple interface Units can be connected to the Dynamometer, giving 12 Temperature channels. The Hand-Controller Mount allows the Hand-Controller to be mounted next to the keyboard. The new Innovate Motorsports Digital MTX Series Air/Fuel Ratio Gauge utilizes the only 100% digital Wideband air/fuel ratio technology on the market! The award-winning patented DirectDigital™ technology we use is faster and more accurate than common “UEGO” gauges and is now more affordable! In addition, the gauge features a water resistant casing, interchangeable faceplates and bezels, and 2 fully programmable linear analogue outputs for use with aftermarket engine managements systems and data loggers! 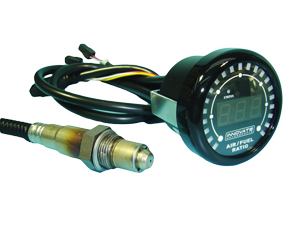 MTX-L: (POWERSPORTS) Complete All-In-One Air/Fuel Ratio Gauge Kit. Includes: Gauge, Silver Bezel, Black Bezel, White Faceplate, Black Faceplate, Bosch O2 Sensor, 3ft. Sensor Cable (Overall length 4.5ft. ), Exhaust Bung, Program Cable (Only needed for Datalogging and to change the Fuel Type Setting), Software CD, and Quick Start Guide.